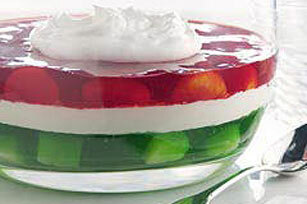 Here's a layered, fruit-filled JELL-O dessert that doesn't require a mold. It's just as dramatic looking, and just as delicious. Stir 2 cups boiling water to each flavor gelatin mix in separate medium bowl; stir 2 min. until completely dissolved. Stir 1 cup cold water into gelatin in each bowl. Refrigerate lime gelatin 1-1/2 hours or until thickened. Let cherry gelatin stand at room temperature. Stir pineapple into thickened lime gelatin. Pour into 4- to 5-qt. glass bowl. Refrigerate 30 min. or until gelatin is set but not firm (gelatin should stick to finger when touched and should mound). Beat cream cheese and sugar with whisk or mixer until well blended. Stir in 2 cups COOL WHIP. Spoon over lime gelatin layer in bowl; refrigerate. Meanwhile, refrigerate cherry gelatin 1-1/2 hours or until thickened. Add oranges to cherry gelatin; spoon over cream cheese layer. Refrigerate 3 hours or until firm. Serve topped with remaining COOL WHIP. At 16 servings, this festive dessert is sure to be a crowd pleaser. Place unopened tub of COOL WHIP in refrigerator. For complete thawing, allow the following times: 4 hours for an 8-oz. tub; 5 hours for a 12-oz. tub and 6 hours for a 16-oz. tub. Do not thaw COOL WHIP in the microwave. Place completely unwrapped package of cream cheese in microwavable bowl. Microwave on HIGH 15 seconds or until slightly softened.